Set within the luxurious Hilton Jaipur, Aurum is an award winning restaurant that offers a theatrical dining experience. 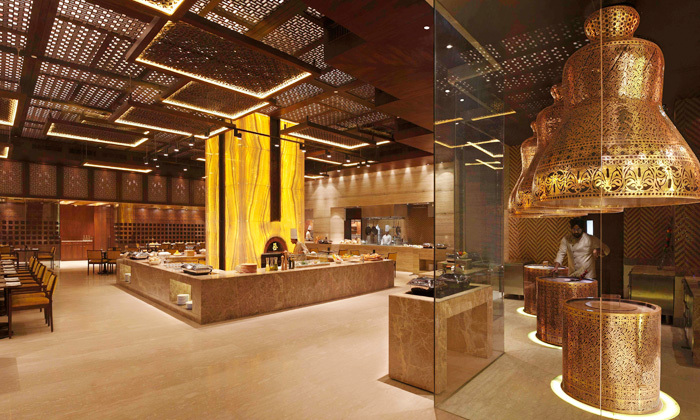 The restaurant features live cooking stations allowing you to appreciate the preparation process. The expert chefs whip up dishes of North Indian, Italian, Asian, Continental and Mediterranean cuisines using fresh ingredients and authentic recipes. They also serve a range of unwinding drinks to pair with your dishes. The restaurant features opulent interiors with high ceilings and warm gold lighting. The inviting and intimate ambiance makes it an ideal destination for both business lunches and a cherished meal with friends and family.